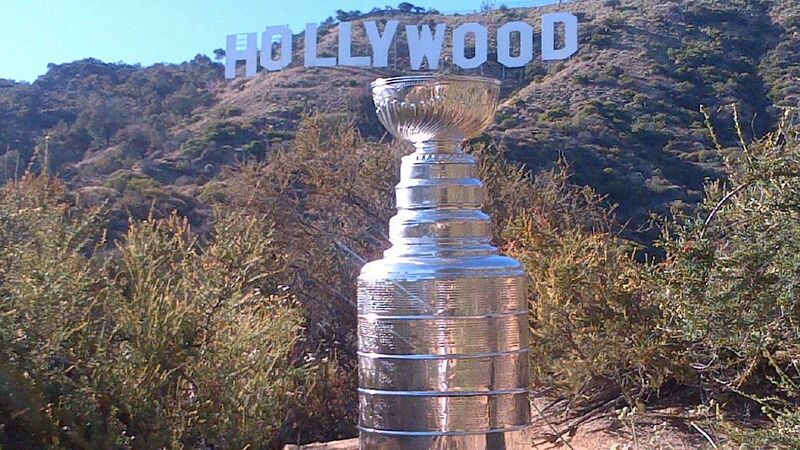 As the NHL playoffs begin, we take a look at what must be the most well traveled trophy in sports. The Hockey Hall of Fame in Toronto, Canada serves as the official home of the Stanley Cup, awarded each year to the National Hockey League playoffs champion. The Hall is well worth a visit, with its prime downtown location near Union Station and the shopping and theater districts. The museum itself hosts a wealth of history, exhibits, and activites. The only problem? You probably won't get the see the Cup. The oldest trophy in North American professional sports travels approximately 300 days a year, more than even the most accomplished jet-setters. For the past 20 years or so, each member of the championship-winning team gets a day with the Stanley Cup and is allowed to take it wherever he pleases. Hockey is such an international sport—"75 countries around the world play the game of hockey," says Phil Pritchard, a Hall of Fame curator and "Keeper of the Stanley Cup"—that a great percentage of NHL players are foreign, and when they win, they want to bring the Cup home or on vacation. In addition to hockey powerhouses like Canada, Russia, and Sweden, the Stanley Cup has been to countries from the Bahamas to Afghanistan, Scotland to Dubai. It's been to places tourists don't normally get have access to, including the Kremlin and tiny villages around Europe. Phil Pritchard gets to go with it; the Cup is his passport. T+L spoke to him about the trophy's global journeys. 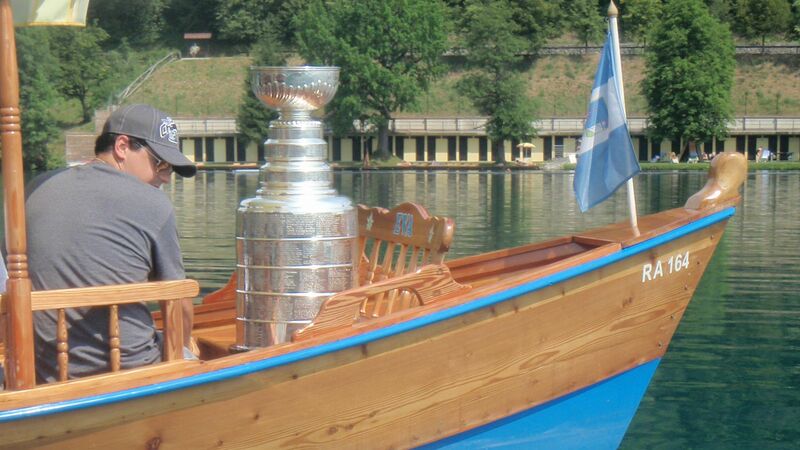 Your job is the “keeper of the Cup.” And when a team wins the Stanley Cup, each player gets some time with it, yes? The team gets the Stanley Cup for their celebration tour for about a hundred days. During that hundred days the players get it, the coaches, the managers, the owners. And basically we [at the Hockey Hall of Fame] have a world map, and we identify all the hometowns they’re hoping to go to, and we become Stanley Cup travel agents for the summer. And you or someone else goes with it wherever it goes? Yes, there’s always one of the Cup keepers with it. We’re the ones who travel on the plane or boat or train or whatever it happens to be—Planes, Trains, and Automobiles, I guess the movie was—to wherever it goes. So last year, for example, with Chicago winning, we were in six countries: Canada, the US, Finland, Sweden, Slovakia, and the Czech Republic. What’s the craziest or most remote place the Cup has ever been? We’ve been up to the Arctic Circle. We’ve been to Siberia with one of the Detroit Red Wings who won. We’ve been to Kandahar [a city in Afghanistan] with the Stanley Cup for the troops. We’ve been to Slovenia, which is not a traditional hockey country—so there are four examples of places you might not normally think of. What is your favorite place that you’ve been with it? I love going to Finland with it. They’ve got a great culture there. It’s an outdoor country. In the summer, they have 24 hours of sunlight a day (in the winter, it’s reverse). So it’s a totally different lifestyle than what we’re used to down in North America here. It doesn’t get dark there, and they love life in the summer, and everybody’s outside. So is everyone staying up all night and partying? Are they still getting some sleep? [Laughs] I don’t know, you look at some of the guys in Finland, they seem to party all summer, and in the winter they hibernate. But I guess that’s the way it is in the Northern countries. [If] you get the chance to be outside, you’re outside. So when you go to a place like Finland, are you just going to Helsinki, or are you going to little villages, or both? Well last year, for Chicago, we went to Helsinki for one player, the Northeast side for another, and the Northwest for another. Three different towns: One was a city; two of them were villages on the water. Totally different cultures in all of them. One’s a fishing town, one’s a lake town. And I just find that the people are so friendly, and they’re huge hockey fans. Their culture and their lifestyle is great. How’s the food in Finland? If you’re into seafood, it’s unreal. What are the logistics of the Cup traveling? Can a player take it in his car? Do you have to check it when you fly? Well the world of travel has changed since 9/11, especially in North America. There were times when we used to be able to bring the Stanley Cup on board [a plane]. We don’t do that anymore. We can do it in Europe, but it’s safer to check it in as luggage. We work with airlines, security, and customs ahead of time so that they know we’re coming. They’ll walk it down to the plane and let us know when it’s on. We usually pick it up at oversized luggage or special services area. When a player’s got it, he usually has a driver or a minibus to celebrate, and we’ll go with him. Does driving it across the US-Canada border ever cause any issues? The customs officials are usually like, “Wow, can we get a photo?” Which is awesome. Has the Cup ever been to Mexico or South America? It’s been across the Texas-Mexico border, about eight years ago, in Rio Grande. It was just a photo opp. There were minor league hockey fans in Mexico who used to come across to Rio Grande, and we took the Cup to them for a photo. The Cup hasn’t been below the equator yet—we need that player from Australia or Fiji and have him win the Cup somehow! How many days of the year is it traveling? Probably close to 300 days. 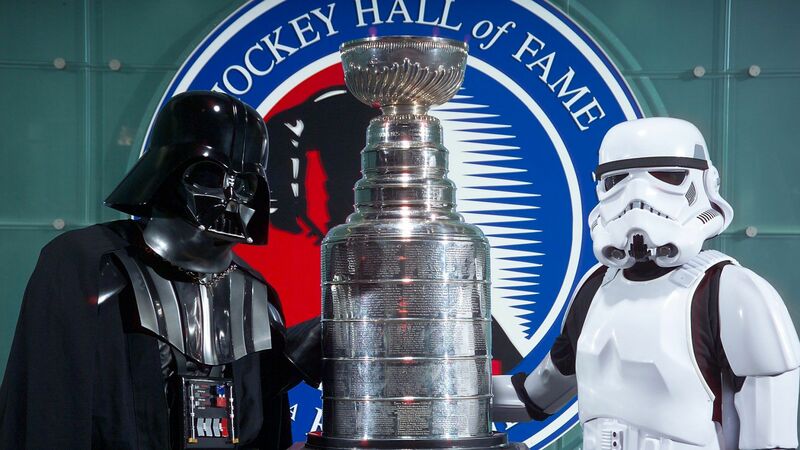 The great thing about the Stanley Cup is that it represents the pinnacle of all of hockey [around the world]. Anybody who puts on skates or picks up a stick, wherever they’re from, wants to win it. It reaches a huge audience. Who is the biggest non-hockey celebrity you’ve seen with the Cup. Well the teams take it to the President every year. Vladimir Putin’s done it, we’ve met the King and Queen of Sweden, the King of Ukraine. We’ve been to Hollywood to Modern Family, The Big Bang Theory. It’s pretty amazing the number of people who are hockey fans. Sylvester Stallone, Tom Hanks…I remember when Shania Twain saw it for the first time, she’s from Northern Ontario, and she wanted to see the small towns of Northern Ontario on it. I mean, she knew everything about it, and I thought it was great. And finally, do any crazy Cup stories come to mind? From a cultural side, the Cup means so much to [the players]. When we’re in Quebec, they have poutine out of it. When we’re down south or in L.A., they do margaritas. In Eastern Canada it’s lobsters. In each culture it’s always different.